Faye Schenkman holds a Masters Degree in Chinese History, is a Diplomate in Asian Bodywork Therapy (NCCAOM) and a Diplomate in Chinese Herbal Medicine (NCCAOM). She is a Charter member and Certified Instructor of the American Organization of Bodywork Therapies of Asia (AOBTA). In addition, Faye is an instructor of Clinical Nursing, Integrative Therapies I. II & III, Graduate School of Nursing at Columbia University. She is a former Board of Trustees member of the New York College for Wholistic Health Education and Research and was Director of the Wholistic Health Center at the College for ten years. 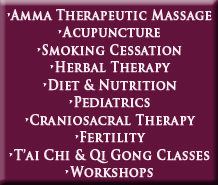 She was also Chair of Massage Therapy and Dean of the Advanced Amma Program at the New York College and has taught Advanced Amma Therapeutic Massage, Chinese and Western Herbal Medicine, Wholistic Nutrition and Oriental Sciences for over twenty years. Faye is currently in private practice with Kim Rosado and the Schnoodles in Huntington, New York. Faye and Kim conduct workshops in Amma, Wholistic Nutrition, Herbalism and Qi Gong throughout the United States.